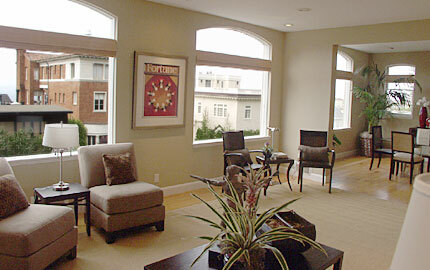 Natural light abounds in this terraced garden home with views of the Bay and the Palace of Fine Arts. 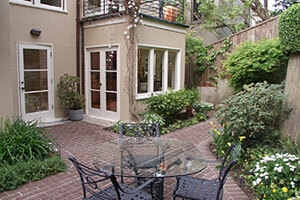 Located on a quiet, tree-lined cul-de-sac in one of S.F.’s finest residential blocks. 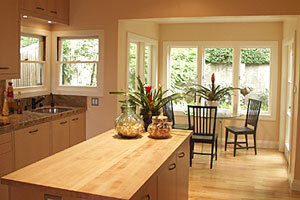 Renovated in 1998 with quality finishes and beautifully maintained. Outdoor living is a most delightful focal point of the home. 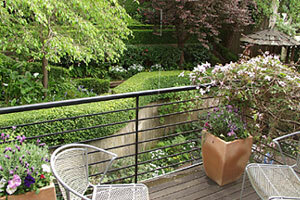 Enjoy alfresco dining and relaxation in the sunny, private PATIO & TERRACED GARDEN. The four terraces are paved with old Belgian stone blocks and railroad ties, alternately planted with azalea & boxwood hedges. Delicate Japanese maples, tall birches, lemon & avocado trees grace the terraces along with cherry & plum trees which blossom in spring! Other flora include camellias, fuchsias, day lilies, rhododendron & jasmine. Enjoy an at-home picnic on the top terrace with views of the Bay! Brick steps with wrought iron banister leads to the main entrance. Center Hall leads to the spacious LIVING ROOM with marble fireplace and DINING ROOM both with views of the Palace of Fine Arts and the Bay through large picture windows with transoms. GUEST BATH & Closet. The fully-equipped modern KITCHEN includes: ample cabinets with granite countertops, butcher block island, gas cook top with ventilator, oven, refrigerator with lower double freezer drawers, dishwasher & disposal. Enjoy informal dining in the cheerful South facing Breakfast Area as well as alfresco dining on the lovely patio. The adjoining STUDY also looks out to the patio/garden. Staircase with South sunny views at mid-landing look out to the terraced garden. 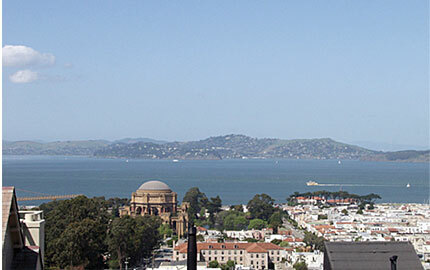 The spacious and tranquil MASTER BEDROOM enjoys views of the Palace of Fine Arts and the Bay. Well-planned, spacious walk-through DRESSING ROOM houses double vanities and mirrored medicine cabinets. Ample closet space for his and her wardrobes. Delightful and private MASTER BATH looks out to the verdant & colorful landscape. Jacuzzi tub and separate glass shower with tile and marble surround. Small balcony. Second BEDROOM with Bay view & third BEDROOM with South facing terrace overlooking garden. Shared full BATH complete this light filled level. From the rear hall, step down to the fourth BEDROOM and full BATH, ideal for an older child, au pair or guest suite. LAUNDRY & utility room, additional storage space. Large two car side-by-side GARAGE with interior access. Exclusions from the sale: two heirloom iron scale posts (with succulents) and ceramic objects d’arts in the patio area.